CAMBRIDGE, MASSACHUSETTS - Among the three branches of the Self-Defense Forces, there has always been a clear hierarchy in prestige and influence: the Ground Self-Defense Force, the Maritime Self-Defense Force and then the Air Self-Defense Force. During the Cold War, the GSDF rose in stature due to its sheer size and the country’s obsession with a Soviet amphibious invasion of Hokkaido. Over time, the GSDF has also managed to win the most fiscal clout. Yet due to the change in the nature of threats facing Japan, from missiles launched by North Korea to maritime incursions from China, the GSDF’s role and significance is being diminished. 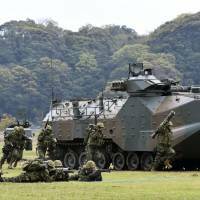 The recent creation of an Amphibious Rapid Deployment Brigade (ARBD) under the command of the GSDF may be best understood from the lens of bureaucratic politics against this backdrop. The ARBD — think of the Marine Corps in the U.S. context — was created to respond to China’s maritime incursions. The unit is being prepared to conduct landing operations to retake Japanese territory. While tactically it may at first glance appear desirable to have this capability, no one seems to have thought it through at the strategic level, under what conditions the ARDB would actually be deployed and what a dangerous world it would be if it came to that. One has to wonder whether this is the most rational strategy for Japan. By the time the islands are taken over by China, Japan has already lost. This new unit, activated in late March, carried out its first training exercise in early April. It is expected to carry out another exercise before the end of the year. The approximately 2,100-member unit is based in southwest Japan and specializes in operations involving AAV-7 amphibious vehicles, MV-22 Ospreys and Chinook helicopters. There has been some attention paid to the fact that the introduction of the AAV-7 amphibious vehicles has been delayed due to production issues. However, what truly deserves attention is the fact that the 40-year old AAV-7 vehicles are not suitable to deal with coral reefs — and 85 percent of the southwestern islands are covered by coral reefs. Defending the far-flung islands will require a new type of amphibious vehicle, yet Japan has already ordered 30 AAV-7s from BAE Systems, and has an eventual requirement for 52 vehicles by 2020. Mitsubishi Heavy Industries is looking into creating new amphibious assault vehicles that may better meet the needs of Japan, but it will still be a couple years before a final product that meets Japanese requirements is ready. 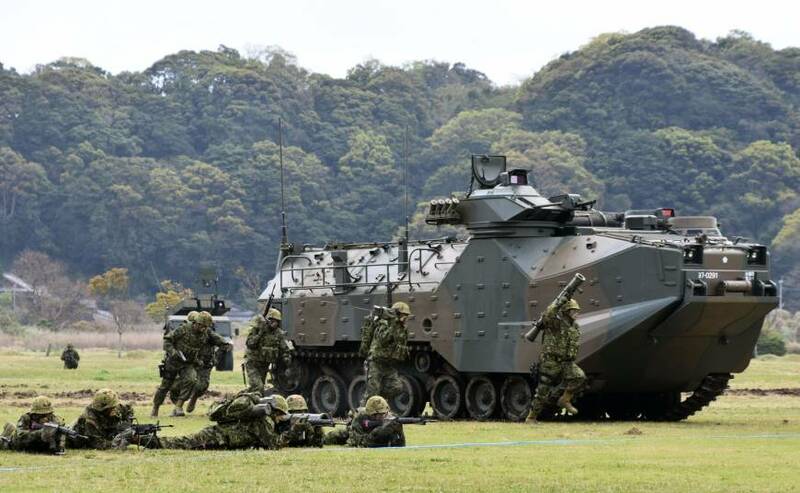 Until then, the AAV-7s may be suitable for disaster relief operations within Japan — but not for the mission of retaking Japan’s southwestern islands. Also, for the first time, the GSDF is considering purchasing transport ships independent of the MSDF so it can respond more rapidly to emergencies in the southwestern islands. Whether such a shift would ameliorate or worsen inter-branch cooperation remains to be seen. One of the benefits of the ARDB is to foster greater cooperation. Finally, the Aegis Ashore system is also a way to get the GSDF involved in missile defense — a top priority for defense planners. Until now, Japan’s missile defense system has relied on the PAC-3, operated by the ASDF, and Aegis destroyers, operated by MSDF. Due to the strains that operating Aegis destroyers places on MSDF personnel, the MSDF would welcome greater GSDF participation through the Aegis Ashore system. In the 2010 and 2013 National Defense Program Guidelines, Japan made notable shifts: from focusing on static defense to dynamic defense, and from focusing on the Russian threat from the north to the Chinese threat from the southwest. It is also time for Japan to recognize that the solutions must match the problems, and budgetary and personnel priority should shift from the GSDF to the MSDF.